Enhance south-south cooperation to ensure data mobilisation efforts address regional sustainable development agendas. 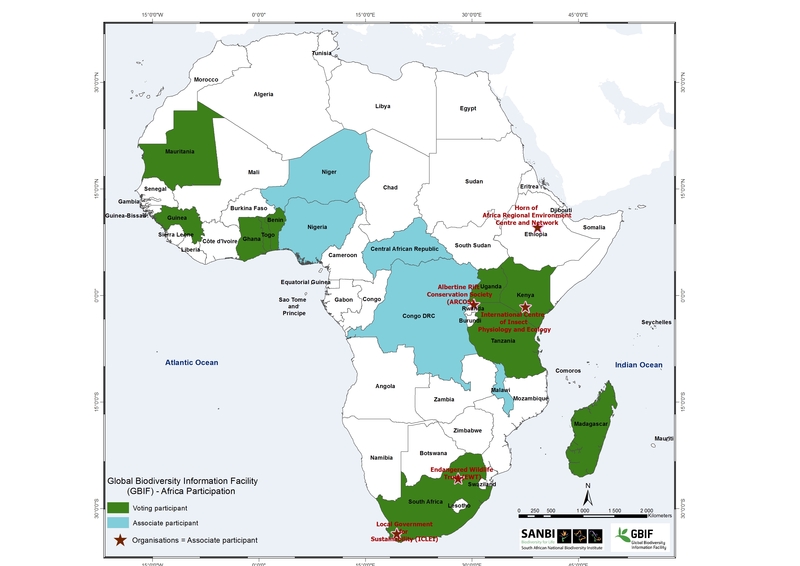 South-south cooperation is exemplified by the GBIF Africa network, which constitutes 17 countries and 5 international organisations. The South African GBIF Node plays a leadership role in convening the GBIF Africa network, and the African Biodiversity Challenge (ABC) forms part of the activities of the Node. SANBI has also developed its regional engagement strategy which provides a framework to guide SANBI’s efforts in the region, in support of national and regional priorities for biodiversity management. The Africa Biodiversity Challenge is an exciting regional initiative and takes forward a number of these strategic objectives, including the mobilisation of foundational data and capacity enhancement in biodiversity information management. The project follows on from a previous JRS-funded project (2013-2014) that culminated in the Africa Rising conference (2015) where delegates from 21 African countries produced a joint Declaration on Biodiversity Information for Sustainable Development in Africa and a Plan of Action for Mobilising and Mainstreaming Africa’s Biodiversity Data. The outcomes of the ABC project will continue the momentum of these initiatives. To capacitate and incentivise three African countries to mobilise as many national biodiversity data of strategic importance as possible (through an adjudicated competition that evaluates quantity, quality and fitness for use) by developing a cohesive national biodiversity information management network. Country engagement and inception (6 months), including establishing enabling environments, creating the organisational structures and refining workflows. Biodiversity Information Management Forum development (6 months), including visiting data holding institutions, prioritising the mobilisation effort and developing and/or enhancing data mobilisation strategies in each country. Capacity development, training and mobilisation (12 months), including tailored training programmes and ongoing remote assistance. Evaluation, monitoring and fundraising (12 months), including assessing the impact of the project, sustaining the momentum of the project through donor-matching and facilitating follow-up projects in each country. This initiative will be managed and implemented by SANBI, in collaboration with GBIF and other project partners, and will build on the networks established in the previous JRS project. It will seek to align data mobilisation efforts with policy by focussing on thematic areas relevant for country reporting and economic processes and thus incorporate the value chain of primary data to information management to decision-making and subsequent feedbacks. The project is governed by a Steering Committee comprised of biodiversity informatics experts with experience in African conservation. This Committee will provide key strategic guidance and oversight on project processes. A separate Judging Panel, comprised of experts with technical expertise in data management and biodiversity informatics, will evaluate all applications and competition outputs objectively using a set of criteria. Cash prizes: the final three selected countries will all receive cash prizes upon successful project completion: USD 30,000 for gold, USD 20,000 for silver and USD 10,000 for bronze. Note: countries will compete to receive the best prizes. Prize money will be awarded to the lead agency at a prize giving ceremony at the end of 2018. Stakeholder meetings: all project teams will be funded to attend an inception meeting in 2017 and the prize-giving ceremony in 2018. Biodiversity Information Management Forums (BIMFs) will be organised in each country to develop data mobilisation priorities (drawing on the toolkit developed in the previous project) and road maps. These will be co-funded between SANBI and the lead agency of each project team. The forums will seek to align with pre-existing national structures such as those pertaining to GBIF Participant Nodes. Steps to become a GBIF node (in the absence of one) will also be identified in a special session. Technical training: all project teams will be funded to attend training workshops on data management and information product development. Tailored training programmes will be developed to address capacity needs of participating countries. Continual support will be provided to the project teams through a virtual helpdesk, where issues can be solved through specific troubleshooting. All training materials will be made publicly accessible online. Show-casing achievements at a prize-giving ceremony: the achievements of all project participants will be widely publicised in the popular media in seeking to highlight the important work being done by the biodiversity informatics networks in each country. Support to find further funding: funding proposals will be co-developed between the project teams and SANBI in 2019 to help sustain the momentum of the data mobilisation activities. The work of the project teams will be matched to relevant funders. Please note: if you are not successful in this call, the details of your project will be archived and assistance will be provided to find alternative sources of funding for your project. Also see Competition Rules, Additional Information / FAQs and News Items.